The global car applicators market is anticipated to witness a tough competition among the players, due to high fragmentation with presence of big, medium, and small players all over the world. This practice is obstructed by established players in the market. , In order to expand their global reach, the major firms in the market are indulging in mergers and acquisitions, so that they can set their foot in bigger regions. For an instance, Bosch Packaging Technology took over a well-known industrial firm, Kliklok, in 2015. This is a clear depiction of inclination towards acquisition. Some of the major players in the global cap applicators market are Closure System International, Tetra Pak, Tecnocap Group, Accutek Packaging Equipment Companies, Inc, Federal Mfg. Co., Krones Ag, Karmelle Liquid Filling & Capping Solutions Limited, Crowns Holdings Inc., Bosch Packaging Technology, and E-PAK Machinery, Inc. 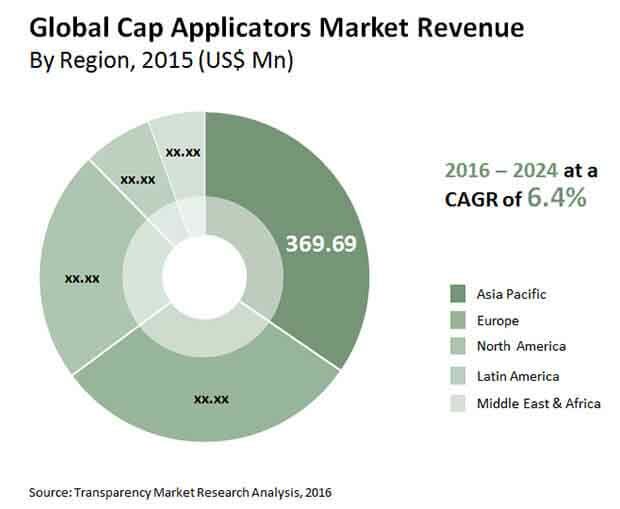 According to a recent report by Transparency Market Research (TMR), the global cap applicators market is prognosticated to expand at a steady CAGR of 6.6% within the forecast period from 2016 to 2024. In, 2016, the market was value around worth of US$1,133.8 mn, which is likely to reach around worth of US$1,866.7 mn by the end of forecast period, 2024. On the basis of variety, the automatic cap applicators segment is estimated to lead all other segments in the category, as far as revenue is concerned, in terms of revenue, surpassing the semi-automatic and hand-held types. On the basis of geography, Asia Pacific region is likely to dominate the market undisputedly, with a significant CAGR of 6.6% within the forecast period. Manufacturers of the products have advanced with immensely customized and newer versions of caps and closures at the time of designing the products. This is a key pattern in the business as it would as well surge the demand for different capping applicators that can be used with changing designs. Owing to this, the market is foreseen to benefit enormously from the newer designs of caps within the manufacturing sector. Besides, the inclinations of the customers continue to change which prompts the producers to acquire development, and take into account the requests of the customers. This is estimated to make massive space for the cap applicators market once it begins getting customization demands from producers. There is a surge in the market with respect to the accuracy of refurbished or utilized or restored capping machines that could perform the majority of the task of the new apparatus. This encourage the producers to keep utilizing the old tools with a specific end goal to evade additional cost for new tools. The proclivity to utilize old apparatus holds back the growth of the market, making it difficult for the cap utensil firms in the market. Additionally, an impossible to miss issue looked by these organizations is the good usage-life of the cap applicators. Despite the fact that, it ought to be a positive sign for the business, and stress on the reliability of the market players, the durable equipments keep the share of new ones and hampers market development. In spite of the difficulties, the developments in the packaging sector alongside the presentation of modified capping designs, the market is likely to remain healthy. Manufacturers of the products have advanced with immensely customized and newer versions of caps and closures at the time of designing the products. This is a key pattern in the business as it would as well surge the demand for different capping applicators that can be used with changing designs. Manufacturers of the products have advanced with immensely customized and newer versions of caps and closures at the time of designing the products. This is a key pattern in the business as it would as well surge the demand for different capping applicators.